Green roofs can range from roof gardens with raised beds and pots, to rolled-out green carpets, to shed roofs containing planting cells that are filled with soil or compost and planted up with low growing perennials and grasses. Green roofs can be intensive, with gardens on rooftops, with shrubs, climbers, perennials, bedding and even small trees, or they can be extensive, with green carpets of low maintenance creeping plants. These generally require a 5-15cm (2-6in) depth of growing medium that can consist mainly of lightweight inorganic materials such as perlite, leca, sand, rockwool and crushed tiles or concrete. The typical layers of an extensive green roof include waterproofing and insulation layers, a root barrier membrane, a drainage layer, a filter layer and then the growing medium above. It may be necessary to incorporate drains into the system, which should be boxed in to prevent them clogging up. For diagrams and further information, see Livingroofs.org. Ready-grown mats of sedum grown inside geotextile pockets filled with substrate are often available from contractors who install green roofs. These are usually self-sustaining and should not require watering or weeding if the species chosen are appropriate to the climate. These need 10-20cm (4-8in) depth of growing medium, enough to support perennials but not shrubs and trees. They can be created, for example, on a gently sloping shed roof by building a grid of wooden cells on top of the roof and filling the cells with compost. Suitable waterproofing, root barrier, drainage and filter layers are necessary. Semi-extensive green roofs take 12-18 months to establish, during which time they will need maintenance. 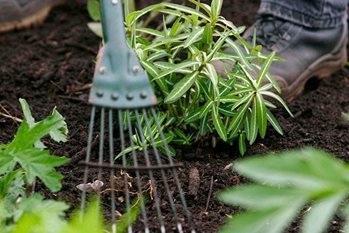 Hand weeding, watering and feeding are all necessary, and it may sometimes be necessary to replant areas that have failed. These are usually container or raised bed gardens. They need at least 30cm (1ft) depth of growing medium, much of which needs to be organic matter. Built-in raised beds require planning and construction by suitable architects and/or contractors. When choosing containers, consider using lightweight plastic, metal, or fibreglass pots and troughs. Make sure there are ample drainage holes in the base. Use lightweight growing media such as multipurpose compost and rockwool. Compost can be further lightened by incorporation of perlite. Using polystyrene instead of broken pots to crock the bottom of pots will also reduce load. Remember that the lighter the compost, the faster it will dry out and the less heavy it will be for anchoring plants. Plant supports such as wires and stakes may help prevent wind rock, and pots can be bracketed to walls or floors to prevent them blowing over. Containerised plants need watering all year round, except in freezing or very wet conditions. Rain showers do not often penetrate pots well, so watering may still be necessary. In summer, plants may need watering twice a day, or more for small pots. It may be wise to install an irrigation system if you are unable to keep up with manual watering. Make sure there is adequate drainage to deal with water run-off in storms, and stand pots on pot-feet in winter to allow for drainage of excess water. Extensive green roofs: Mat-forming species of Sedum, Sempervivum and moss are good choices. Common Sedum species used include Sedum acre, S. rupestre, and S. album. Delosperma could be tried in a sunny frost-free area. Ferns such as Polypodium vulgare and Asplenium trichomanes could be used in dry shady conditions. Semi-extensive green roofs: Try dry habitat perennials and ornamental grasses such as Rudbeckia, Achillea, Potentilla, Armeria, Dianthus, Helictotrichon sempervirens, Stipa tenuissima and even bulbs such as Muscari, or small Allium species such as Allium flavum and A. pulchellum. Intensive green roofs: Drought tolerant plants are good choices, as they tend to be both sun and wind tolerant. See our page on drought resistant plants for further ideas on plants for an intensive roof garden.